"Her (Preston's) work has consistently taken technical and philosophical risks, achieved unique depth, and established Ms. Preston as one of America's most important contemporary landscape painters." I recently interviewed Preston and spoke with her about her exhibition, her work, and her artistic direction. JS: I understand that in preparation for your current show you have photographed hundreds of trees, many of them in Japan. Have you ever considered showing your photographs? How do you use your photos to inspire paintings? AP: My son lives and works in Tokyo, so before our last visit, I ordered canvas, linen and wood panels, my height: 66" and then 33" wide. I had planned on doing tree portraits on these surfaces. So while I was in Japan I photographed any tree or cluster of trees that speak to me. The black pines there are especially striking. 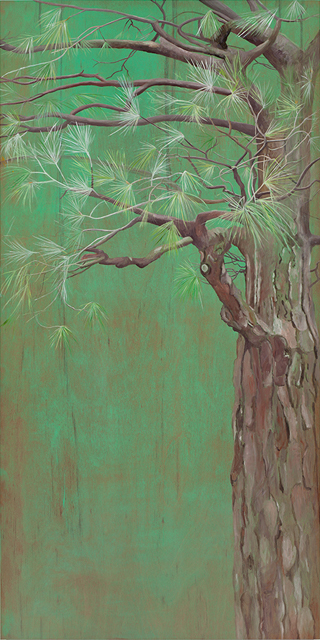 Astrid Preston, "Black Pine Ginkaku-Ji," 2012, oil on panel, 66" x 132"
I do use the photographs as a tool and inspiration for my paintings. I take images that interest me, but I don't see like a photographer. I only see what I want to use. I have photographer friends and they see what is actually there and framing is important. Some of my photographs are of that level, but I don't enjoy the technical aspects of computers, so getting the color and contrast right on a digital print would not give me pleasure. JS: Many of your current paintings are on hardwood. Can you tell me how you choose and prepare the wood, and also about how the color and grain of the wood influence your paintings? AP: I enjoy a certain amount of chance in the actual wood surface. I order by size and never specify what kind of wood. Then the wood color and grain pattern provide limitations and inspiration. Since I usually have many photographs I want to work from, I see which images would be best with the given panel. I had not worked on wood before these paintings. 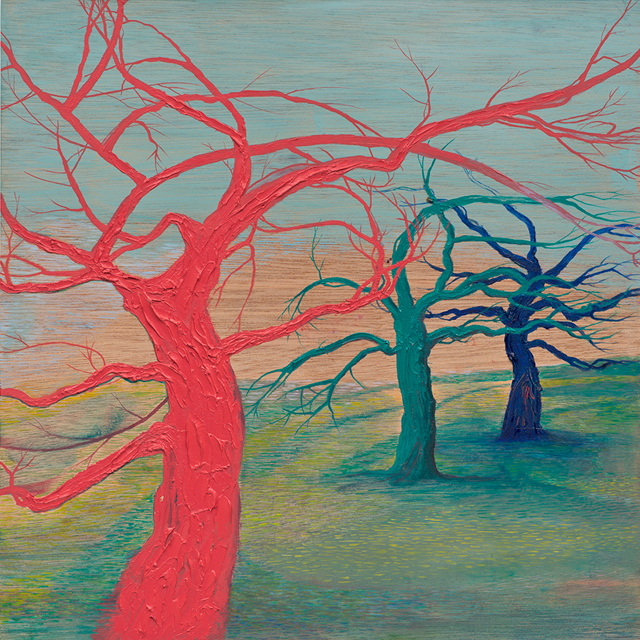 Astrid Preston, "Toward Hiroshima," 2012, oil on wood panel, 16" x 16"
The first portrait on wood was of red pine trees. The wood was so beautiful, that I realized I'd better do some studies before I proceeded, so I ordered some small 16x16 inch wood panels to use for studies. Some of those are in the show. For the first one I tried, I used a wash, and had already decided to make the trees red, so I did the wash in blue. I loved it and kept the background simple. With the trees I used the grain in a vertical direction to repeat the direction of the portrait (full body). I don't do any preparation on the wood. I was asked to do a fund-raising project for the Santa Monica Museum just after this, and I proceeded to paint over 100 small tree paintings on wood veneer (called wood paper). This is when I discovered how some of the wood grain looks a lot like water. For this last trip -- the month after the big earthquake and tsunami -- my son wanted to visit as many islands as possible, but he only had a week of vacation, so we traveled around the Inland Sea. I have always liked the 16" x16" inch size, so I ordered more and more wood panels and started the small water paintings that are in this exhibition. 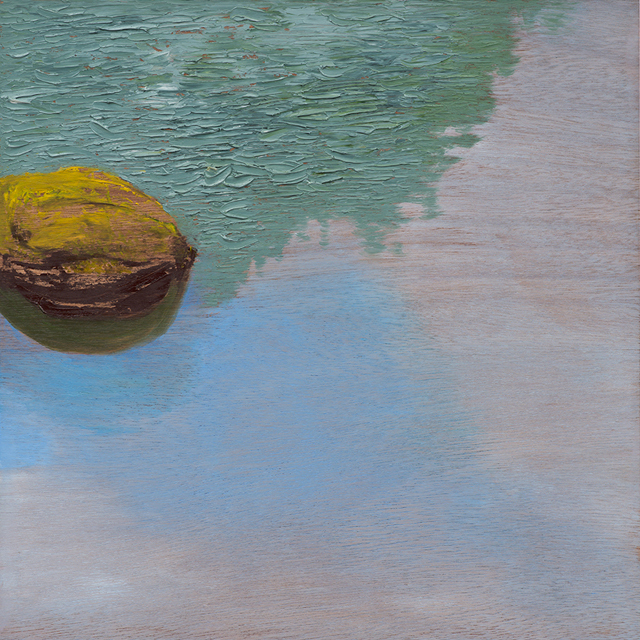 Astrid Preston, "Little Rock Little Pond," 2012, oil on wood panel, 16" x 16"
JS: How have Hiroshige and other Japanese artists influenced your art? AP: While I have limited myself to nature painting my two loves have been Renaissance art -- Durer, Vermeer, etc -- and Chinese/Japanese, landscapes on silk or paper. I love the magic of the illusionistic, glazed painting of Europe and the detail and delicacy and lack of perspective in the Chinese/Japanese. 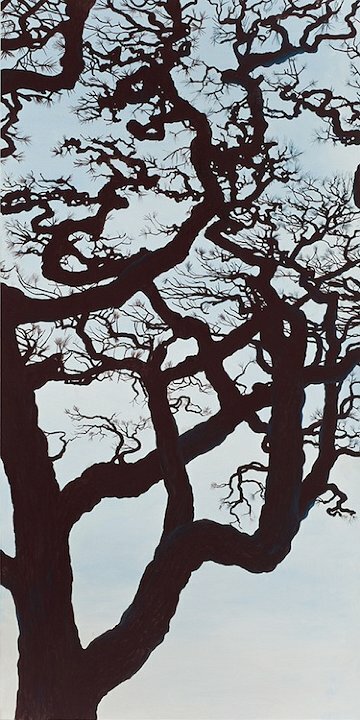 Astrid Preston, "Black Pine in Ritsuren-koen," 2011, oil on canvas, 66" x 33"
JS: To what degree do you depict nature literally, and to what degree do you alter it as you paint? AP: All of my paintings are primarily internal landscapes. I start with some image, scene, or detail that speaks to me and paint it in some way, color that seems to be right. I like to start with the literal so that I don't get stylized or make the same image repeatedly. Most of the images in this show are very simplified from the complexity of the photos. I paint and change until I capture something that surprises me, feels emotionally and visually "right", often it has changed dramatically from the original vision. 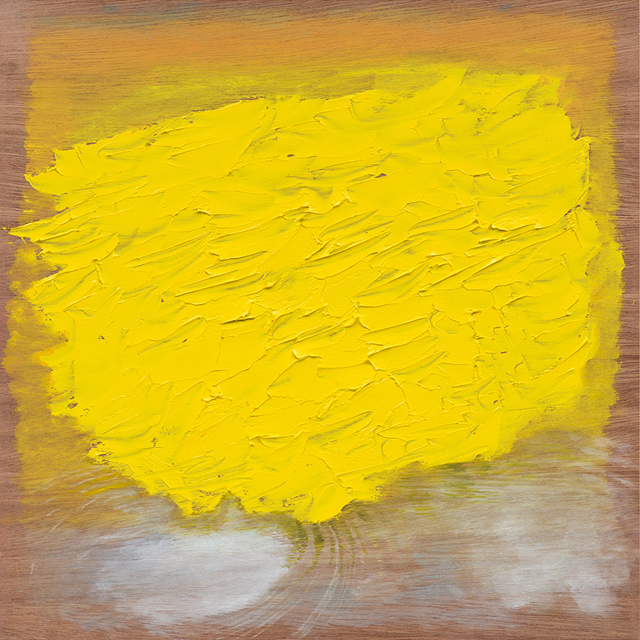 Astrid Preston, "Thirsty Sun," 2012, oil on wood panel, 16" x 16"
One painting that didn't change much is the most abstract in the show. For "Thirsty Sun" I had put some washes on the wood veneer, to create the feeling of a small pond. The pond photo I was looking at had a glare of the sun in it. I had already started using the palette knife to build up surface on some of the paintings and had a real need for yellow, so I had the idea to make more of a feeling of the sun than just a white smooth glow on the illusionistic pond. This is one of my favorite paintings in the show. I added the ripples at the bottom to have an illusionistic reference to reality. It was a big leap for me. None of the paintings are nonrepresentational. 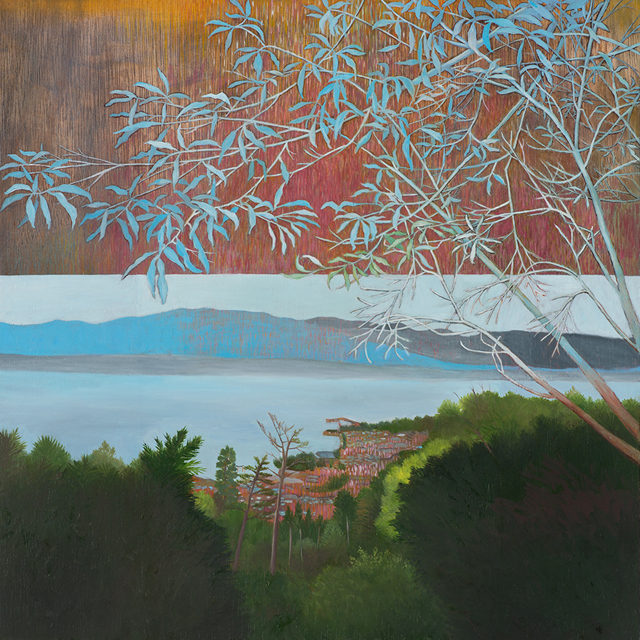 Astrid Preston, "Early Spring on Naoshima," 2012, oil on linen, 66" x 132"
JS: There is tremendous delicacy in your work: how did that develop? Have you always been such a patient artist? AP: Before painting became my dominant medium, I drew. I drew almost exclusively for ten years. Fine lines and mark making were my main interest, so as I learned to paint better, I included more fine painted lines. Astrid Preston, "Trio," 2012, oil on wood panel, 16" x 16"
JS: What direction do you think your work is going next? AP: I want to explore the new possibilities of mark making that I have started here, but on a larger scale. I don't know what that will entail, but more complexity for sure. 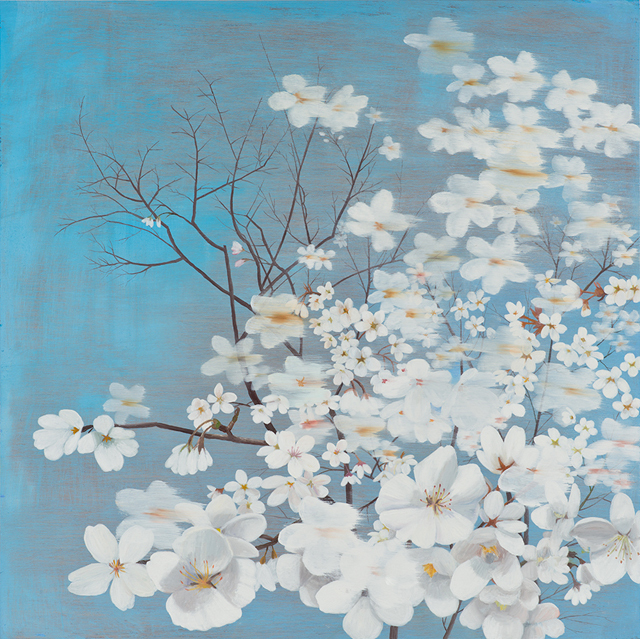 Astrid Preston, "Blossoms," 2012, oil on wood panel, 16" x 16"
JS: You have a fantastic garden in Santa Monica. Do you paint there? AP: I can only paint in the studio, there are too many distractions in the garden. I do draw there though. I have a fantastic view out my windows, so I have painted that scene before, but I find it easier to take a photo and work from that. As I said, they are internal landscapes. 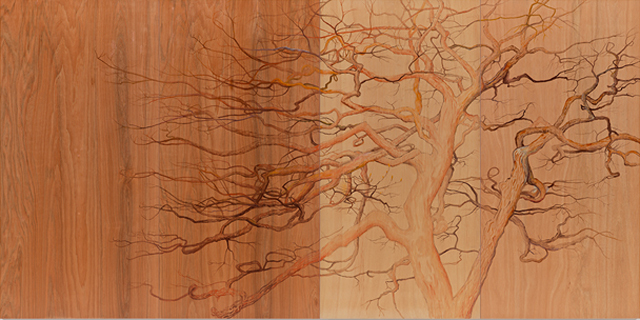 Astrid Preston, "Imperial Pine," 2012, oil on wood panel, 66" x 33"
JS: Is there anything else you would like to say about your work and your artistic practice? I am always trying to find the new in the familiar. I am trying to create a more complex visual vocabulary for myself. I like to have a tension between figuration and abstraction in these works. I use a different strategy in each painting. Also, in the talk, the nature of artifice came up. Most of my images are from gardens, so the human presence is there in altered wildness, recreating man's concept of paradise, and then again in my translation.